16 pp, red paper covers. An advise book for young boys hoping to succeed in business. The book is broken up into categories: One thing at a time, the way to win (all on one page), the things explained, and hard to understand. On the first page of the book, it describes 'the chance' each boy takes in business. It states "a boy can do some things better than a man. These are given to boys to do; but boys who do them well are scarce.... A girl is a boy in business." The interior cover page lists the author as "by a man who was once a boy himself and knows what boys are good for and what is good for them", however the author, J E Powers, appears under the copyright notice. Title Cover: How a Boy Had Better Behave in Business and What is Going to Come of It. Measures 3 3/4" x 2 1/2".. Minor edge wear. Toning due to age. A single fold circular with information on lengths, manufacturer and fabric type and price per pound or yard. Special attention is invited to Remnants of Wool Cassimers and Dress Goods, which we sell at a very large concession below list prices. Terms included. The back page is an illustration of the buildings exterior, located at 11th & Market Streets. Measures 9 1/4" x 5 3/4". Letter folds..
A 3 1/2" x 4 3/4" heavy stock card with an applied embossed scrap of a young nurse. The card is titled "May Christmas Fine You Well and Hearty". The verse reads "But if you're sick of everthing and want some dainty coddling, Never mind the Doctors, with their wrangling and their muddling, Get a pretty Nurse, such an one as here you see, Who's treatment will, I'm sure, with your system quite agree, She's got a charming method for male patients, simply bliss, For she cures ev'ry ill with a nice 'dose of Kiss'. Reverse is blank. Light wear. 107 pp. A comprehensive guide to various patterns for needle point utilizing the manufacturer's products to make them. This catalog is the 8th in the series. It starts with a beginners guide to needlepoint, along with B&W photographs of the various stitches used in needle work. The treatise includes B&W illustrations of the designs, and templates for them, as well as 20 color illustrations of completed designs. The templates are for a variety of nature inspired elements, including plants and animals, as well as decorative styles, such as eyelet stitching. Measures 8" x 5 1/2".. Front cover fully detached, back cover partially detached, with most of the back strip missing. The interior pages are toned, with some stains. Smart costumes for the statuesque actress for various roles she played.12 5/8" x 10 3/4". Number of Dolls:2. Doll Size: 11 1/2"<. No of Costume Pages: 4. The printed questions for the written exam for common school teachers in Caledonia Country, Vermont. The took place on Saturday, May 6, 1883, and when from 9:30 AM to 2 PM. The printed exam starts by listing the regulations and standard of qualifications for the exam before continuing onto a section called 'General Questions', which is essentially the biographical information of the test taker. From the the exam is divided into four sections: Geography, Grammar, Arithmetic, and History. Each section has ten questions. Some examples of the questions asked are: Which as the greater area, Europe or the United States? Define Etymology. Compare goo, little, round, and honest. Divide .34 by .0034. Who would be President of the United States if the present chief magistrate should die? Printer Measures 9 1/2" x 5 1/4".. Original crease marks. Minor toning and staining due to age. 111 pp journal on nursing. The 'Trained Nurse and Hospital Review' was the pioneer nursing publication in American and it ran from 1893 to 1950. This item is the September 1926 issue. The front cover features a photograph of Stella Boothe Vail (a prominent nurse of the times and a specialist in children's health and hygiene) done by H. W. Simmons. Some of the articles in this issue are: "The Nurse's Part in Prenatal Care", "Helps in Pediatric Nursing", "Nutrition Forum: Food to Tempt Children's Appetites", and "A Guiding Code of Ethics in Nursing Relationships." Item includes a newspaper article on Stella Booth from the NY Sun Globe, March 1924. Measures 10" x 6 3/4" (journal), 9 3/4" x 7" (newspaper article) . Minor cover wear. Pages are toned due to age. The article has red pencil on the bottom detailing the name and date of the newspaper. 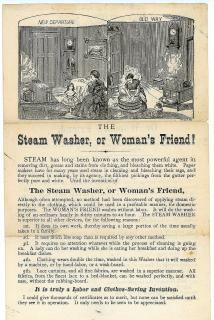 An 8 1/2" x 5 1/2" illustrated two-sided flyer promoting the Women's Friend Steam Washer. "The latest, the cheapest, the best--no rubbing, no pounding, no turning or tearing, no clumsy cylinder, and no twenty or thirty dollars expense. Steam does it all. This is followed by instruction on use- essentially soaking the clothes overnight followed by an elaborate series of washes, rinses and steam. The reverse depicts before and after illustrations of the miserable life before and the life of leisure after acquiring a steam washer. This is followed by five reasons why the steam washer is a woman's friend including that lace curtains, and all fine fabrics, are washed in a superior manner...."It is truly a Labor and Clothes-Saving Invention..
A 2" x 3 5/8" business card for -Mrs. Meudekin's Lace Laundry, 587 Wentworth Avenue , part of Hawthorne's Laundry, Chicago ILL. Window Shades a Specialty Decorative devices accent "Lace Laundry" giving it a particularly feminine touch. Reverse is blank. . An 8 1/2" x 11" two-sided typewritten and mimeographed newsletter. Includes information on New Study Groups, Equal Rights Panel, M.O.R.A.L. Teach-In, Females and Self-Defense, Washington Conference, Street Rallies, B. U. Women's Center, and Self-Defense. This is followed by a Calendar of events for October 13-18. The group was located at 1126 Boylston, Boston. . The group was established in 1970. 24 pp, red illustrated wrapper. This recipe book had easy recipes for which one could use canned Asian ingredients at home. The book starts with the way rice is cooked in Japan, and continues on to recipes for a variety of Chop-Suey sauces such as Plain Chop-Suey, Tomato Chop-Suey and Chinese Chop-Suey. While some of these recipes are variations of oriental recipes (Egg Foo-Young), majority of traditional dishes Americans in the 1920s would have been familiar with, but with an Asian twist. For example Japanese Pork Roast, Chicken Souffle, Oyster Cocktail Sauce, Salmon Croquettes and Fruit Salad. The Oriental Show-You Company was founded in 1918 in Detroit by Shinzo Ohki, a Japanese immigrant. The company imported shoyu, now more commonly known as soy sauce, and tea from China. In 1922 he moved his company to Columbia City, IN, and began bottling his own brand of shoyu, along with other Chinese foods such as canned mung bean sprouts, chow mein noodles, and chop suey. The company would be bought out in the 1960s by Beatrice Food Inc, and later La Choy Food Products. At its peak the company was making approximately 30,000 gallons of soy sauce per year. There are six black and white engravings placed through out the book, which always have at least one of the companies products features in the illustration. Measures 7 1/4" x 4 1/2". Minor fading on the bottom of the front cover due to light damage. Interior pages are toned due to age. 112 pp, with hand colored illustrated covers. A cook book focusing on baking with over a 100 recipes for such items as meat pies, pudding, Spanish fitters, and ginger bread. The front cover illustrations has been hand colored. Measures 5" x 3 1/4". OCLC - 1 only (March 2018). Heavily cover wear. Both the front and back covers have detached, but the front cover was reattached with tape. Both cover are missing small sections. Pages age toned. Minor water stain on the edge of approximately last five pages. A hard cover folio with a watercolor of an elegant lady holding a feather fan on the front cover. The insert is a Ladies' Laundry List booklet. It includes approximately 75 unused pages of items to be laundered. The left side is the laundry list to be retained by "The Lady" and the right side list to go with the laundry. The form includes the date number of items to be laundered and the cost of laundry. In it's original blank box. Measures 4 1/2" x 5 3/4". . Bend, front cover insert booklet. A collection of 7 booklets and a leaflet relating to innovations in preserving of food for the American housewife. The booklets include Canning Preserving & Jelly Making Made Easy by Using a "Wear-Ever Aluminum Canner and a "Wear-Ever" Preserving Kettle with a 'so easy a child can do it' on the cover. Good Luck in Preserving promoting Good Luck Fruit Jar Rings. Peaches and Cream the Whole Year promoting The Atlantic Col-Pac Canner "gives better results with less labor and less expense: round by Atlantic Stamping Company. How to Can Fruits and Vegetables Promoting Ball Fruit Jars by Ball Brothers Company. A chart or leaflet promoting Ball Perfect Seal Rubbers. Recipes for making better James Jellies & Marmalades with Certo (1928). Cold Pack Canning with images from photographs and instructions on canning all sorts of vegetables, meats, etc presented by Good Luck - The Original Cold Pack Rubbers. Better Home Canning with Presto Canning Supplies, presented as a booklet that opens to Canning Time Tables on one side and narrative on the reverse. All include information on the process, why their products are superior and how they are safer and save time. Only two reference pressure cooking. Imagery of the women canning is consistently meticulous, well-coifed women with starched aprons canning without fuss. The largest measures 8" x 5". .
A 9" x 7 3/8" hand colored lithograph. It is titled "A Victim of Woman's Rights". It depicts a gentleman in an apron with his hands in the wash tub while a disapproving wife looks on. It is captioned "That's right, Old Dad, stir up the suds, And haste to purify the duds; But ere I'd have a wash-tub lover, I'd take and whitewash him all over". Letterfolds and discolorations. 32 Edition. 24pp. Includes a description of scale and definition of technical parts, taking measures,notes for beginners, for drafting the back, for drafting the front, tracing front, drafting sleeves, etc. The tool allowed the cutting of all styles of patterns without refitting. Illuistrated. Measures 9" x 6". .
32 pp. Information on Perfection Tailor Body System, Perfection Tailor Sleeve Rule, Perfection Tailor Skirt and Collar Rules. Illustrations throughout. Includes instructions for women's and children's garments. Measures 9" x 5 3/4". . A front and back paper doll created by Forbes Co. consisting of multiple parts to be joined to create the object. The 81/2" x 5" card Compliments of The New Home Sewing Machine Co has a main figure of a sewing machine that folds at top for insertion of head and shoulder component of one of two women - a young lady or an older woman--your preference. It is accompanied by a 9 1/2" x 3 1/2" card is to be cut and constructed to create a back drop for the sewing woman. It is an image of a house and is captioned "Our New Home". Reverse of both cards blank..
Unnumbered pages includes both color and black and white illustrations. Few with captions suggesting that the items may make a nice hanky, etc. A note on the title page indicates this is a Needlework Book with Silk-Patterns-Needle and Transfers Fourteen (14) different pattern pages' each in black and white and color. The designs include nursery rhyme characters, chicks, puppies, and circus performers. Each page has numerous transfer images. Dust jacket with some repair. Measures 8" x 6 1/2".. some wear on dust jacket, 7 + pp paper doll book - 1 and a 1/4 card stock pages and the back cover are the punch out dolls. The remaining 2 pages are a page of cut-out costumes for each doll. The paper dolls are created after six (6) real models from the John Robert Powers Modeling agency with illustration of Powers looking up at the model lineup on front cover. Images from photographs of Doris Meyer, Angela Green,Lillian O'Donnell, Frances Donelon, Helen Dillard and Eileen Nolans. Each page has a theme including models for the Movies, the Newspaper, as a Dancer, the Radio Star Model, a career girl Model and a Stewardess Model. Each with appropriate background illustrations. Measures 14 3/4" x 9 3/4". .
An accounting for a Ladies Sewing Society associated with the Congregation Church in Chester, VT. The author of the book changes every two to three years as a new treasurer is appointed. As such, the level of detail of the accounts varies over time. The book starts in 1853 with Mrs. Asa Davis as the Treasurer and ends in 1883 with Mrs. H. L. Slack. Additionally in 1865 the society renamed itself to "Ladies Congregational Benevolent Society." The book makes note of funds received for sale of items constructed by the Sewing Society, the dues paid by different members, and items purchased with the funds such as yarn or food. At the end of the book are three pages that list an accounting of "Pew Owners" and how much they have paid towards their ownership. This list is not dated. Board covers with applied marble. 56 leaves. Measures 7 3/4 x 6 1/4. Three different 7 3/4" x 9 3/4" photos on larger mounts. The first photo depicts six women seated around a table knitting with a wall size American flag in the background. Each of the women is knitting. The women are identified. The secondis the same room with a much larger group of woman and captioned D. A. R. in Assembly Room, Trout Hall, April 8, 1918. Not the posters on the mantel; one an honor roll of women who will work to win the war. The second is "Are You 100% American? Prove It! Buy U.S. Government Bonds. The third photo depicts the first group of woman sipping tea. This was part of the Knitting for Victory campaign were women in America were encouraged to knit socks, scarves and sweaters for the soldiers -- middle and upper-class women were carrying their knitting with them everywhere. Sponsored by the Red Cross.. The photo with the group of six women appears in Images of America - Allentown, Bartholomew and Front. 2002.